This is a Sephardic dish. The Turks loved it so much that they have claimed it as thier own and it appears the Greeks have too. As far as the syrup desserts in Turkey this could probably be the lightest. In some areas you can buy this from a man pushing an enclosed cart for 50kurus a piece. 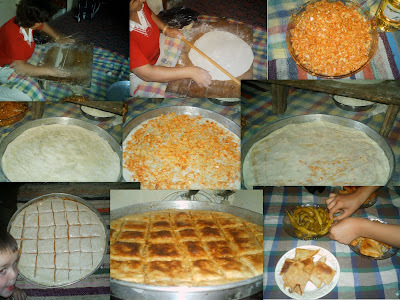 When I lived in Adana there was a very old man walking the streets of my neighbourhood selling this. I used to buy a few slices and it really was and still is the nicest one besides mine of course that I have tasted. I asked my husband about him and he said that this man was selling Revani on the streets when he was a small child and it still tasted the same. This mans wife makes it every day and her husband then goes off to sell it. I used to be worried that he wouldnt sell all but my fears where allayed as he was an institution and everyone bought off him. Revani is also a very easy cake to make and there are 2 stages in making it. First you have to make the cake batter and then there is making the sugar syrup. It is traditionally made with lemon but you could switch that with orange if you preferred. You could also add in poppy seeds and have a Turkish style orange poppy seed cake (one of my favorites). You can make this without the baking powder for those who would want to make it for Passover, what you would do is add a couple more eggs and beat the egg whites until stiff then make the cake without the flour and yogurt. 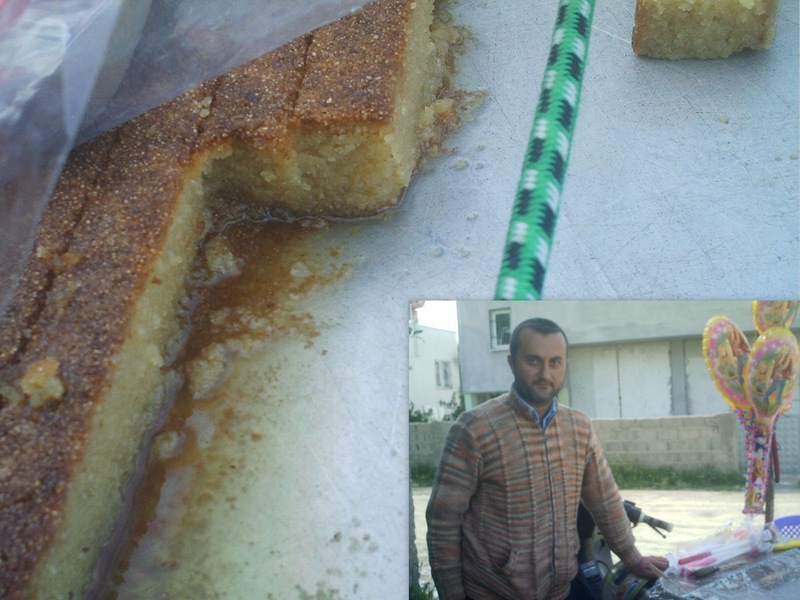 You can see in this photo that the Revani seems heavier, they have used more syrup the one above is a bit lighter. This man was selling pieces of Revani off the back of his motor bike at the wedding I went to. First make the syrup by adding the sugar, water and lemon juice together bringing it to the boil and let it boil for 10 minutes, after that time you should have a nice thick syrup. Beat the eggs and the sugar together in a large bowl. Beat for about 5 minutes. Add in everything else and beat well. Pour into an oiled cake tin, I use a pyrex baking dish. Bake in a moderate oven at about 350 degrees for about 35 to 45 minutes until it is nice and brown. It should spring back when done. When the cake has cooled slightly pour the syrup over it bit by bit. Let it soak up first before pouring any more on. If you dont want a syrupy cake pour less, if you want a heavier one use a little more. Cut into squares and serve. This post is a bit different, for the last couple of months my family has been fighting a few health issues so I have been making weekly visits and stays at the hospital. I have found it a bit difficult to focus on various recipes hence this post about miracles that can be found in the kitchen. Last week I featured Thyme,so this will mark the start of a regular series 'Kitchen Miracles'. The Turks maybe more than my own culture seem to utilise natural remedies regularly. There is one man I like, he is a Professor and he appears on alot of the various daytime tv programs. His name is Prof. Saracoglu and he has researched natural cures using herbs and foods that are found locally in Turkey. One very interesting item is the Brown Onion. He says that if you boil it for 5 minutes and drink the water before lunch and dinner for 15 days that it can do amazing things. It will increase your egg count for those that are finding it hard to conceive, it is very good for those with prostrate problems, going through the hot flashes with menopause? drink this onion drink and your symtoms are said to reduce. Overian cysts can be helped, painful periods, heavy periods, is good for loosing weight, for those with chronic acne or anyone with a femine discharge issue, Swollen hands-feet-legs-stomach are all said to be able to helped by drinking this miracle liquid. If that has struck a chord with anyone and you want to know how to do it, its easy. Take a medium sized brown onion and peel it, cut it into quaters and boil for 5 minutes in a saucepan(with the lid closed)in 300ml of water. You can drink this tepid or cool. Drink 2 times a day, 10 minutes before both lunch and dinner. Do this for only 15 days then take a break of 10 days before repeating. Here is a soup recipe using brown onions that I made for my daughter as her favourite food is soup and she has had a long stint of bronchitis. 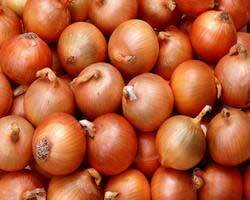 Onions are supposed to be fantastic for any lung infections, asthma and respitory conditions. I took the chicken bones and cooked in my pressure cooker for 1 hour. Take out the bones and strain. Slice the onions and put into the chicken stock. Cook in a pressure cooker for 40 minutes. Add salt to taste. Add more water if necessary, I added probably about another litre as the stock cooked for such along time. Use a hand blender (immersion blender) and pulse it through the soup at the end. This is such a delicous, light soup that it will be a regular at our house from now on. Dondurma is the Turkish word for Ice Cream. 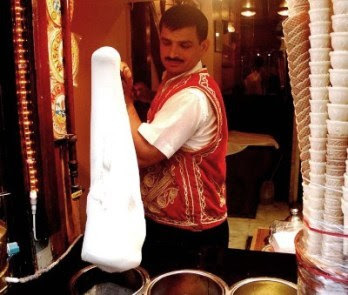 The only icecream worth eating is Maraş Dondurma. It is icecream you can eat with a fork, made with orchids and goats milk. This is our family favourite and it is mainly available in Summer so we try and make the most of the season by visiting our local Icecreamery as much as we can. I personally dont like the taste of goats milk but you would never know that this was made from that. It is smooth and creamy and not too sweet. The orchid roots make the icecream thick and pliable hence the amazing feats some people do with it. The most popular flavour here in Turkey is plain, I cant say vanilla as I cant taste any hint of it in the icecream. Then because we are in Gaziantep is Pistachio. Next they have chocolate, strawberry etc,dont expect to find 101 different flavours but thats ok because the icecream is so superb plain is the best way to go. I was lucky to find a man selling fresh thyme at the bazaar the other day so I bought some. You may also have heard of Zataar which is another word for this lovely herb. You can buy zataar powder which has sesame seeds and other things blended in with it. Kekik which is the Turkish word for this herb is used I believe mainly as a tea. Zataar is fantastic spread ontop of flat bread with olive oil. Sprinkled ontop of eggs in the morning. Eaten with olive oil as an appetiser. Sprinkled ontop of labne. I have mixed it in with my falafels and just about anything. It really is a must try. Kekik tea is quite refreshing and has very good benefits mainly for respritory complaints. It is supposed to be able to clear lung infections and help with coughs and used as an expectorant. Thyme tea also has calming effects as it lowers cortisol levels in your body. It also helps with muscle spasms and thyme oil can be used mixed in with a carrier oil and rubbed into the affected area. You can also use this oil rubbed into the chest and back for respitory infections. It is an antibacterial so can be used for skin infections such as athletes foot. Used as a mouth wash it is said to be good for gum problems and is also one of the main ingredients in listerine. This is one herb that is a must in any kitchen and not only has a lovely taste when fresh, when dried can be used in any dish. For those of you interested in healing with herbs or with foods thyme is a champion. Simon and Garfunkel are one of my favorites. Who dosnt remember the song Parsley, Sage, Rosemary and Thyme? Since they have a song with Thyme why dont we listen. Semizotu, Soğluk and Pirpirim are the names given to Purslane. Why there are 3 names for the same weed in the same country beats me. I was confused when I ate a semizotu salad and it resembled soğluk, I asked the hostess and she said no no its semizotu. Depending on where you come from depends on the name you know it by. I first ate this when my mother in law came back from her garden with a few handfuls of it. She waved it in my face and said yemek, yemek (food, food). I wasnt so keen on it then but after making it myself and tweeking her recipe it is one of my favourites. There are 2 simple salads that are both equally delicous and easy to prepare. Also both are great for the Meze table. Chop the purslane up very finely and place into a bowl. Add in the yogurt and rest of the ingredients and beat well until everything is mixed in. Place onto serving dish and serve. Finely chop the purslane and place into a bowl. Add in the minced garlic, pinch of salt and the juice of half a lemon or full lemon, depending on your taste. Stir very well and kind of mash it at the same time or use your washed hands and mix and squeeze at the same time. Splash in a bit of olive oil and serve. 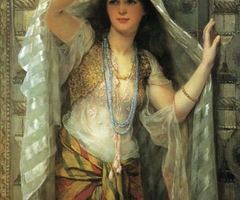 Every culture is different and beauty means different things in most cultures. Turkish women want to be beautiful just like every woman on the planet. There are some things they do to help nature along straight out of their kitchens. 1. For those who want long beautiful dark eyelashes try using almond oil on your lashes at night. Put a drop or two on your clean fingertips to rub onto your lashes, starting from the eyelash base to tip. Any excess can be massaged very gently onto the base of your eyelashes. I have been assured this will work wonders. 2. Watermelon juice dabbed onto your face with a cotton ball and left for 15 minutes or so is great to revive tired looking skin. 3. Rose water splashed straight onto your face works as a good tonic and alot of Turkish girls use it before moisturising and putting on makeup. 4. Lemons cut in half and rubbed all over your body while you are in the bath or shower will make your skin squeaky clean plus rubbing onto your face whilst being careful not to get any in your eyes is better than all those expensive vitamin C creams in any makeup department. 5. Cleopatra came to Turkey to soak in some natural springs and while she was sitting there she took some of the local clay and used it on her face and body. Any colour clay made into a paste with water used as a mask will bring all the blood to your face so increase circulation and tighten it for a few days. Doing this once a week is a great idea. 6. Olive oil is really just great for everything. Rub it all over your face and body as a safe moisturiser. It is suitable for all types of skin even oily, just use sparingly in those oily zones. For your hair you can do an oil treatment to make you hair shine. Pour oil over your hair and massage into your scalp and hair ends, wrap it in plastic wrap or a towel for a few hours or overnight. Rinse off in hot water the following morning. 7. Hazelnut oil is produced in Turkey and is a very reasonable price as in the Black Sea Region they grow 75 percent of the global production. Hazelnut oil is not an oily oil so is good for oily skins and not only moisturises your skin but aslo tones it. 8. 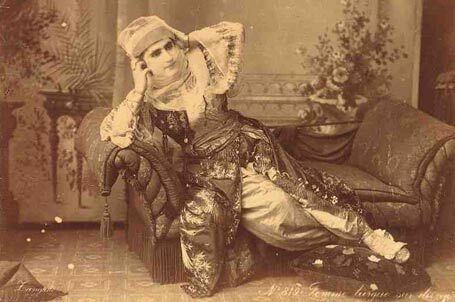 Henna was used in Ottomon times in the harems for body art but also had practical uses. There is a whole cultural thing that dosnt seem to be particular just to the Turks where they would go to the Baths after menstration to purify themselves. They would use it in thier hair as a natural hair dye. Various body regions after epilation. On thier hands and feet for decoration but also the deepness of the colour would show when the woman was ovulating. When the colour was at its deepest would show when she was at her peak for conceiving, thats why henna was applied after her menstration. The point for henna I want to focus on for beauty is for your feet. A paste made from henna and spread over your soles and heals will protect and also stop cracked heals. We all know that cracked heals arent particularly attractive especially when the hot weather comes and we want to wear flip flop and sandles. 9. Sugar, used for hair removal. Sugaring as it is called is a method of using sugar for epilation instead of waxes. 2 cups of sugar, 1/4 cup of lemon juice and 1/4 cup of water mixed together, brought to the boil then simmer for 25 minutes until it is a nice dark amber colour. This is supposed to be not as irritating to the skin as most waxes. 10. Yogurt! what Turkish beauty tip list would be complete without yogurt. Used as a mask for your face will soothe your skin plus help get rid of blemishes. It can be used for your hands and nails as well when mixed with a bit of lemon juice to make them look younger. All of those things may not be in your kitchen cupboards but they are in mine. I try and use natural items when it comes to my maintence program as it is usually best, easiest as we dont have to go out searching and cheapest because you arent going after brand names that are filled with all sorts of chemicals. Turkish women look after themselves and thier skin and hair usually always look great. Now you know some of thier secrets you can look great too. Kumpir is the Turkish version of rebaked poatatoes but without the rebaking. It is also the best Street Food Istanbul has to offer late at night. You can see rows of vendors all making Kumpir for the hungry crowds. They bake the potato then stuff it as full as they can with all sorts of toppings. Olives, Peas, Corn, Mayonaise salads, cold meats(cold cuts) and lots of cheese. This video shows you how they make them on the street, I will give you the basics on how to make them at home. Bake the potatoes until soft in the centre. Cool. Slice the top off or cut into halves. Scoop out as much flesh as you can and mash with some butter, margarine or olive oil. Put the grated cheese on next and mix a little. Add your toppings and serve. You can serve this with extra mayo if desired. These are loaded with fat! you can skip the mayonaise and mayonaise salads if you prefer to make it a bit lighter, you also dont have to mash the potato up with butter, marg or olive oil. Serve with a salad and with ayran. To make this rebaked just put under the grill for a few minutes. Adding a bit of cheese on the top of this then grill it, this is good too. 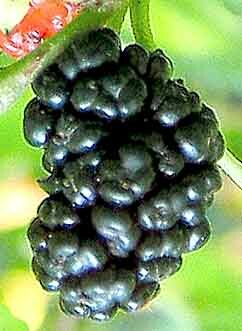 Mulberries are a wonderful fruit and very healthy. They are also very maligned as the trees drop their fruit then the bugs come, the poor trees get cursed and hacked at just because people dont harvest this wonderful fruit. What can you do with them other than just eating them straight off the tree? in my opinon that is the best way to have them but if that dosnt grab you they are very versitile. My parents have a fairly sizeable property(farm)that have or had (dont know as I havent been there for years)several prolific producers. They picked them and either ate them raw or my mother would stew them and pack them into the freezer to be eaten later. That is the typical western approach to mulberries as we really dont know how to use them. If you dont have a mulberry tree look around your area/neighbourhood and see who has and see if they wouldnt mind someone coming in to clean up the mess made by them as well. Sometimes you can find empty lots of abandoned homes and farms with trees as well. I am all for urban foraging and suggest you do the same as you never know what treasures you can find. Since coming to Turkey and living an eastern lifestyle I have realised that there are many other ways to enjoy them. When we lived in Adana one of the houses we lived in had a yard(garden, backyard) and it had a couple of mulberry trees one was white and the other was dark. The white ones are good for eating raw and they are not too sweet. I also discovered at the local bazaars that they sold the white mulberries dried! I dont know how they dry them as they are not sticky so they must do something to them. I tried to dry some on my roof and it all became a sticky mess. When we first came to Antep we went to the main park and I was interested to see men selling drinks on the street, after taking a closer look I realised it was mulberry juice they were selling and for only 50 kurus a cup. Thick, sweet with a slight bite it was wonderful. They say it is liquid penicillin, whenever I go to the city centre I make sure I buy a cup of mulberry juice. I also discovered Pekmez which is a thick syrup used in cooking or as a general tonic. With the help of my family we harvested the black mulberry tree by everyone holding a sheet under the tree and my oldest son climbed the tree and shook the branches. We then squeezed the mulberries through a cheesecloth to get the juice. I then took the juice and boiled it until it became thick and syrupy. Making it is very easy if you have a supply of fruit. Pekmez is a syrup so stays fresh in the cupboard without further processing. After my sucess with making Mulberry Pekmez I decided to make Mulberry wine. I did the same thing, collected the fruit-squeezed to get the juice then let it sit in a container for a couple of months. I tasted it drained out the dregs and let it sit again. After 6 months it became a thick, sweet syrupy wine. Absolutely delicous. If I could find another 20 kilos of fruit I would make this wine again in a heartbeat. So what has all this to do with Mulberry leaves? well Im getting to that. The mulberry leaves are also edible. You can use them to make yaprak dolma, dolmades and stuffed grape vine leaves. All you have to do is to substitute the grape leaves for mulberry ones. Mulberry leaves are furrier than grape leaves you say, yes they are but that all goes away when you boil them. To prepare them for stuffing you need to blanch them for a few minutes in boiling water. Drain. Click on this link for the recipe to stuff the leaves. You might notice a difference between the stuffed grape leaves you might be used to seeing in your local deli and these ones. Turkish ones are usually thinner than their Greek counterparts. I like both but do prefer the thinner ones. For the Turks the thinner the better, if yours are not rolled tightly enough or are too fat expect to hear disparaging comments. Less is more again in this situation. The plate you see below was prepared by me not by a relative or neighbour. This is my husbands neice Nuriye and when we saw her last she was very excited and wanted to make a cake to post on this blog. She lives in an area of Adana and this cake is typical of what young girls her age are learning to cook. The cake was light and moist so all in all she did a great job and it tasted great. In a bowl whisk the eggs and the sugar together, after a few minutes add the yogurt and the oil. Mix well. Add in the desired amount of coco powder and the baking powder, mix well. Slowly add in the flour until everything is well combined. Pour into cake tin and bake in a preheated oven on a moderate to high heat until cooked. 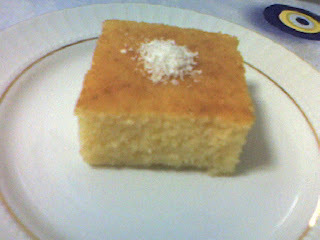 Nuriye used a pkt of something for the top but you can use some sweetened labne with a bit of lemon in it. Turks eat alot of cheese. I have heard that there are over 100 different types of cheese throughout Turkey. All the different regions again making thier own specialities. Cheese is mainly eaten for breakfast or used in the cooking of various böreks. There are some cheese desert recipes as well the most famous being Künefe, Kadayif Noodles with Kaşar Peynır. The most popular cheeses are Beyaz, Kaşar and Tulum. Tulum cheese has a white or cream colour, soft-crumbly texture and a high fat content. İt is traditionaly made in sheep or goat skins and left to mature, also being made from sheep or goats mik. You can now find Tulum cheeses maturing in other containers. Kaşar cheese can be made from sheep or cows milk and resembles a processed cheese. İt is suitable for cooking ie melted cheese on toast or for pizza. Beyaz cheese is the one probably most widely eaten. This is very similar to fetta. There are many versions of this cheese. Some being just as salty as fetta whilst others are nice and smooth more akin to cream cheese. You will find this cheese on a meze menu and is very popular when eaten with alongside Rakı. Dil cheese. This has a similar taste to Kaşar but instead of moulding it they stretch it, it becomes fiberous and comes in strands. This is nice for breakfast. Orgu cheese is very nice, can be a bit salty. It comes in little braids so looks great on a plate. It has a firm texture. Van cheese resembles beyaz cheese but has a mixture of herbs added into it. It is a speciality from Van. Lor cheese is the main ingredient for böreks and isnt a solid cheese instead it is the curds. Maybe more like a dry cottage cheese. 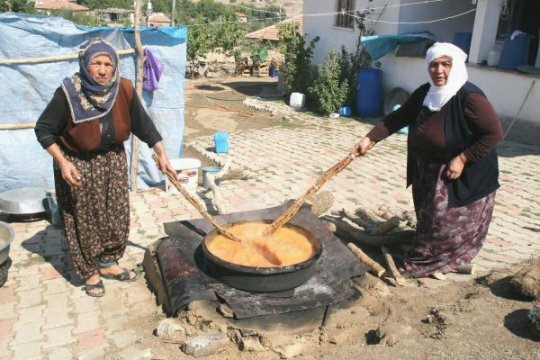 I love the way the Turks cook green beans. During Summer when they are in season we eat these a couple of times a week. Again very easy to make and a different way to eat beans if you are growing them and just dont think you can face another steamed bean. There are 2 ways you can cook these as well. The photo above has more liquid and is good for a main meal. You can also have these without the liquid and eaten cold as a side is great addition to any Summer table. Also great for Meze, this comes under the term of Olive oil dishes which are all eaten cold. Top and tail the beans. Chop into halves or thirds. Put aside. Finely chop the onions. In a saucepan add some oil and cook the onion until clear. Add in the beans and cook for a further 5 minutes. While the beans are cooking stir. Add in enough water to cover and cook until the beans are cooked. If you like garlic can be added when you start cooking the onions and also mint when you add in the water. To cook these as a side instead of using the tomato paste grate 2 or 3 tomatoes. Cook the same way but cook the beans until the liquid has gone, also using less water. One glass should suffice but check the water level so the beans dont burn. Serve cold as a side.